Aberdeen midfielder Stuart Duff has signed a two-year extension to his contract. The former Dundee United player has impressed since joining on a short-term deal in January. Aberdeen have also signed French goalkeeper Bertrand Bossu on a two-year deal. The 27-year-old recently had spells with Darlington and Walsall. Irish midfielder Sammy Stewart, 17, has joined from Irish outfit Glenavon, also on a two-year contract. Bossu, 27, has joined after impressing on a trial period following his departure from Walsall. The 6ft 7in keeper has had a string of clubs in England without establishing himself as a regular starter but he hopes to have better luck at Pittodrie. "I have been unlucky," he told the club website. "For Gillingham I started playing a few games in the Championship and got injured, and that was it. "It was the same at Darlington, I played a few games and broke my foot." Dons manager Jimmy Calderwood is also tracking former Motherwell midfielder Richie Foran and aims to agree a deal with Southend United soon. 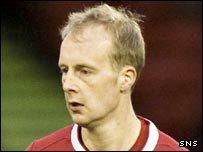 The Irishman moved away from Fir Park in January 2007 for a fee of £150,000 but he was shipped out to Darlington on loan for the second half of this season. And director of football Willie Miller is hopeful full-back Alan Maybury will stay on after his January switch from Leicester. "We would be delighted to keep Alan," said Miller. "I have had long conversations with him. He seems to have enjoyed his time at Aberdeen. "He has been playing at a high level and a high level financially, that we cannot compete with, but we hope to compete in football terms."